Fall is quickly closing in on us in New York, but this past weekend we were graced with enough lingering warmth to squeeze in one final cookout. Sadly, I've been knocked out of the FoodBuzz competetion. Boo! But, I happen to think the challenges are pretty cool and I'm going to write about some of them anyway. Take that! 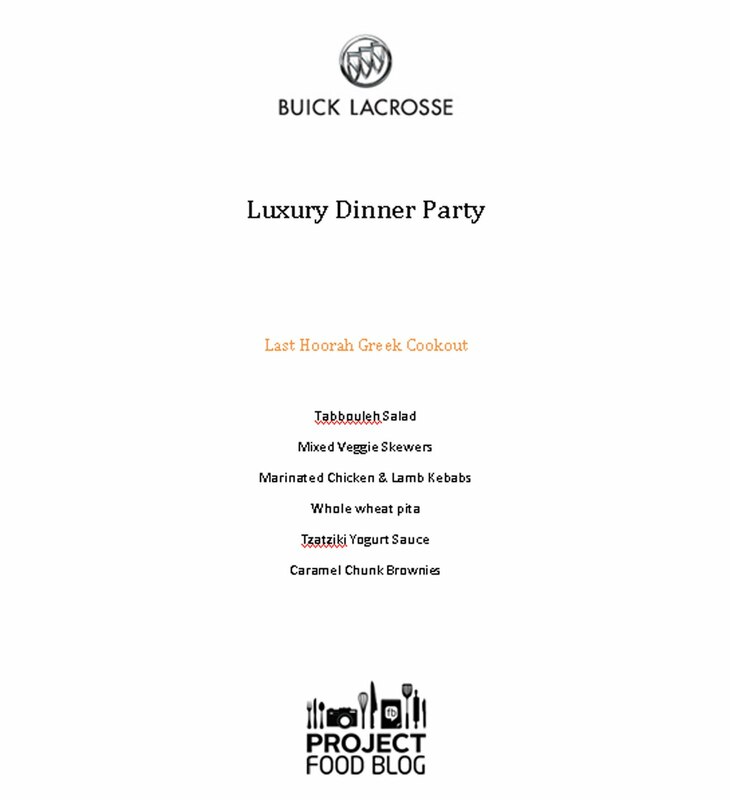 The next round was to host a luxury dinner party that introduces guests to new and exciting culinary phenomenon. My numero uno, most important entertaining tip is to host a party that fits the occasion. You certainly wouldn’t invite people over for a luxurious four course, wine-paired meal for your German Shepherd’s third birthday. My husband and I are big-time football fans (go Jets!) and our friends were joining us for the game. Why not officially close out summer with one last BBQ? It might be hard to attach the word “luxurious” to a laid back Sunday cookout, but tossing some meat on the grill seemed like the perfect game plan. In order to understand this post, you need to understand my friends. Diana and Marc are absolute sweethearts and I love them both dearly, but this adventurous eating craze is brand new to them. Their top two favorite foods are still holding steady at ketchup and Cadbury Cream Eggs. You get the picture. I tried to come up with a menu that was adventurous enough for my company, but wouldn’t completely freak them out. The MARINATED LAMB KEBABS are killer. I use non-fat plain Greek yogurt for the base and mix in a whole bunch of lemon and thyme. The yogurt helps to tenderize the meat and gives the lamb a tangy zip. Definitely grill the kebabs to medium rare. That will help the little cubes of meat stay nice and juicy. The yogurt that didn’t make it into the marinade went towards a quick tzatziki sauce. Some Greek yogurt sauces use mint, but I happen to love dill. Up until a few weeks ago, it never occurred to me that dill pickles get their taste from the dill herb. Super, major DUH moment on my part. I love pickles. Now I love dill too! The cucumber in the sauce adds the perfect little crunch on top of the tender meat. 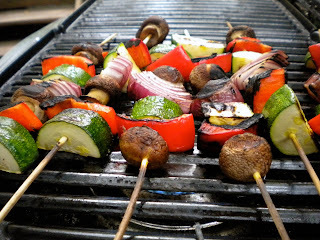 Also joining the kebab party are mixed veggie skewers. Maybe I’m just a sucker for grilled things, but some simple olive oil, salt and pepper was all they needed. To finish it off, I went with one of my favorite go-to salad recipes, TABBOULEH. 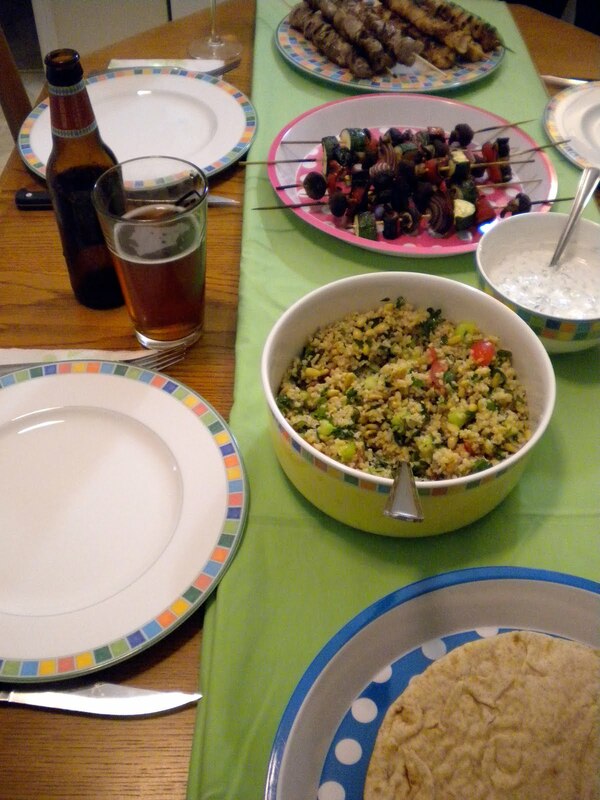 The dressing on the tabbouleh ties together the lemon in the marinade with the cucumber in the sauce. It was the perfect co-star. 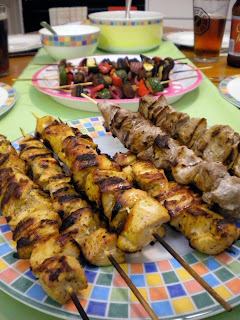 In comparison to the hamburger and hotdog counterpart to this grill-fest, my Greek themed menu is extremely healthy. The marinade/grill combo is one of my favorite ways to add huge bursts of flavor without needing to cover something in a heavy traditional barbeque sauce or globs of ketchup (sorry Diana!). After sitting through a quick photo shoot, I finally let my friends dig in. Even my lamb skeptics were impressed. 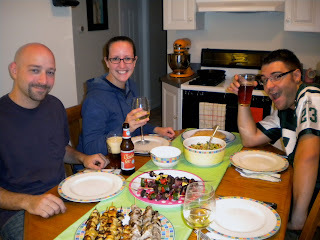 I made some chicken skewers as a back-up plan, and to my surprise and excitement, didn’t need to resort to Plan B! Sweet! We ended the meal with Diana’s amazingly decadent Caramel Chunk Brownies. I’ll just tell you how good they were because photo evidence would be too damn tempting! Hosts put a lot of stress into throwing the perfect dinner party. But really, what’s a party anyway? Spending time with some of my closest friends, enjoying delicious food and sipping a favorite wine? Sign me up. As the cook, a successful party means knowing that I served my pals an awesome plate of food with a side order of my awesome personality (sarcasm often included)!